There’s a new book that’s guaranteed to help you re-live your fondest travel destinations, while wetting your appetite for more. Around the World in 80 Cocktails by Melbourne writer and bartender Chad Parkhill with illustrations by Alice Oehr (Hardie Grant Books), lets you drink your way around the globe with 80 exotic concoctions featuring a span of the world’s rarest and most popular spirits. From classics like the Singapore Sling and Daiquiri, through to more obscure cocktails such as a Fish House Punch (Philadelphia), Hanky Panky (London) and Flame of Love Martini (Los Angeles), you’re sure to flex your happy hour repertoire. Even New Zealand gets a mention, with the Falling Water (see below for recipe). 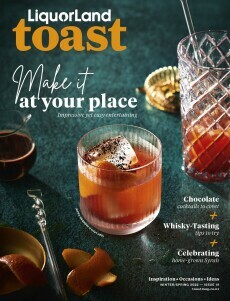 This week, Toast has two copies of Around the World in 80 Cocktails to give away to lucky readers. Once you've recreated the Falling Water below, go to the bottom of this article to get yourself into the draw. Place vodka in a Collins glass and add Ch’i. Top with ice. Garnish with a long, thin slice of cucumber. This is an edited extract from Around the World in 80 Cocktails by Chad Parkhill with illustrations by Alice Oehr published by Hardie Grant Books NZ$34.99 and is available in stores nationally.